Smita Chandra is the best selling author of 3 renowned Indian cookbooks and the Easy Tandoori cooking app (available for iPhone, iPad and Android). She is a spokesperson, recipe developer and brand ambassador for Kraft Canada, recipe developer for Sofina Foods, food consultant and recipe developer for Saveur magazine in New York. Smita teaches cooking at Centre For Food at Durham College, Kraft Kitchens, LCBO, Fortinos and other area cooking schools. She is a freelance food writer for several publications, TV personality and South Asian cooking expert. She has made several popular How To videos on simple cooking techniques and dishes, including cooking commercials for television and appeared on several prominent TV and radio shows such as Christine Cushing, Anna Olson, The Mom Show, Kitchen Equipped, CTV’s Balance, Breakfast TV, Mary Ito’s More to Life, CBC Radio’s Fresh Air, World band media, and national Public radio. 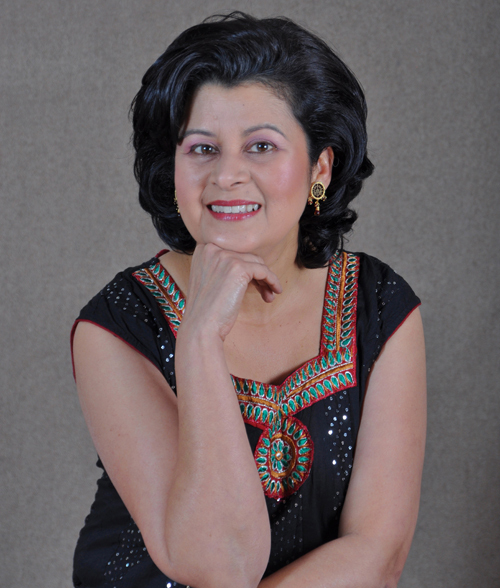 She has written articles for Toronto Star, Desi Life magazine and many other publications, done live cooking shows and on stage demos for many events and shows such as The Royal Winter Fair, Good Food Festival and the Harbourfront Centre. Smita has been the events coordinator of a Loblaws cooking school for 5 years and has been volunteer chair and organizer of a Health Fair for TREWO for 4 years. Developing South Asian recipes is one of Smita’s strengths. Her wealth of experience, culinary expertise and deep understanding of regional Indian cuisines have combined to produce recipes that create traditional, flavorful and aromatic dishes while still managing to simplify the cooking process tremendously. She has developed recipes for Patak’s, Ontario Potato Board, Unilever, Kraft Canada, Sofina Foods and The Heart and Stroke Foundation. Smita has been a menu consultant, menu developer as well as guest chef for several restaurants such as House Of Moments, The Twisted Fork and a new concept Hakka Chinese restaurant. Smita has also been a recipe tester for the Toronto Star, Toronto Star’s Food Extra supplement and Desi Life Magazine. Smita is a popular cooking instructor at all major area cooking schools such as Dish cooking studio, Calphalon, Kraft Kitchens, LCBO and Loblaws. She was also a guest speaker and cooking instructor at the prestigious Cornell University School of hotel management in Ithaca New York. Smita’s talents go way beyond the kitchen. She has a degree in psychology, a master’s degree in social work and a degree in communications. She has worked as a journalist in India, the US and Canada and has written over 100 by-lined articles. Her vast experience, in multiple disciplines, gives Smita the ability to understand the consumer, and articulate breakthrough strategies for the market. An infographic summary of Smita's career highlights can be downloaded here.